The butterfly garden is wonderful fun for kids and adults alike. When you design your own butterfly garden you will want to provide for all stages of the butterfly life cycle; eggs, caterpillars and adults. Butterfly caterpillars eat different plants than butterfly adults. Butterfly adults generally eat nectar. And caterpillars eat leaves. You will also want some still water for butterflies to drink. A birdbath can often give a butterfly a necessary drink. Swallowtails will often congregate around wet gravel. The passion vines (passiflora species) are famous for providing the Gulf Fritillary caterpillars plenty of food. 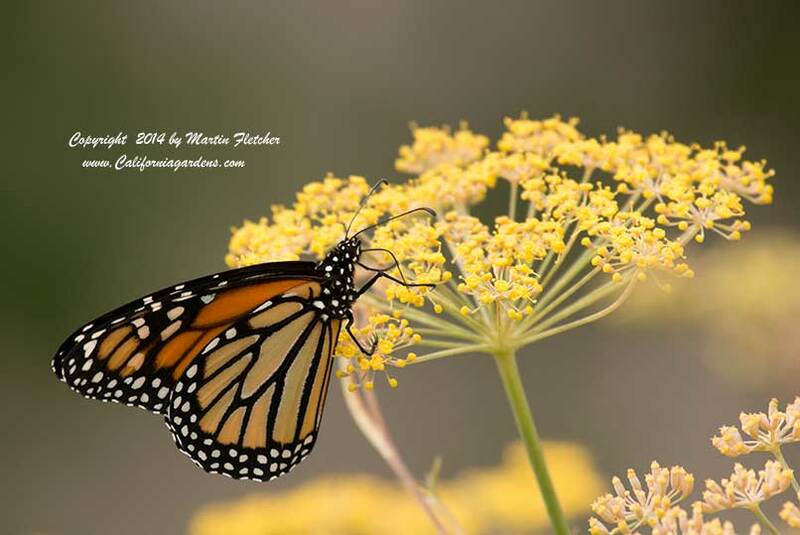 And the Monarch Butterfly has a special relationship with milkweed. The list of nectar plants for butterfly adults to feed upon is lengthy and often very specific to the kind of butterfly that will come to feed. A courtyard or enclosed space can provide a still environment so the wind does not wreck havoc with the movement of the butterflies. A south facing wall will warm the air and allow for an extended day of flight for your butterflies. It is fascinating to watch a butterfly flit through a garden. It seems like they have no preferred destination at all. But they will almost always alight on the same kinds of plants. Easy gardening nectar plants include Eriogonum species, Salvia species, Ceanothus species, and Lupine Species. The list of plants that butterflies will visit is not even close to being complete. Butterflies will visit many other plants. The ones on our list are particularly noted for growing well in California's gardens and attracting the following butterflies.